If you're looking for modern distribution space for reasonable leasing rates, give us a call or fill out our contact form today. We'll be glad to find the perfect distribution property that meets the unique needs of your business. Kasun Development Corp specializes in industrial development and has developed over 1,000,000 square ft. of distribution space since 1985. 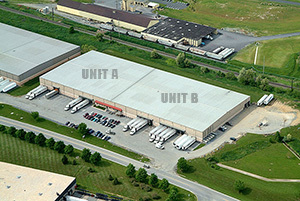 Our current portfolio includes over 687,000 square feet of modern high ceiling, Class A distribution space on 48 acres. We have land available for new build to suit projects as well as existing space. All of our existing space can be divided to meet your individual space requirements. Our management team is small and local so we're able to offer our tenants the best mix of quality distribution space and competitive pricing structures. We react quickly to the needs of companies searching for quality big box distribution spaces. Kelloggs, QVC Network, Firestone Building Products, R.R. Donnelly, Proficient Food Company, Johnson & Johnson, Merck, Nissin Food Company, Lancaster Newspapers, Childcraft Education Corp, Integrated Logistics, US Postal Service, NYNEX, Turkey Hill Dairies, Acme Markets, Pepperidge Farms, Sears Roebuck, Southern Container, Dana Corporation, Glidden Paints, Playschool. So if you're looking for modern distribution space for reasonable leasing rates, give us a call or fill out our contact form today. We'll be glad to find the perfect distribution property that meets the unique needs of your business. © 2003-, Kasun Development Corporation. All Rights Reserved.